The monotony of the holiday season can sometimes bring out the Scrooge in even the holliest and jolliest. It's the same old song and dance every year. Thanksgiving feast comes and goes, you go through the Christmas routine, then head into the new year without feeling like anything has really changed. If you're sick and tired of your usual Christmas routine, then its time to spice things up. Whether you live on the East Coast or at the Eight & Grand apartments in L.A., try out these festive alternatives. 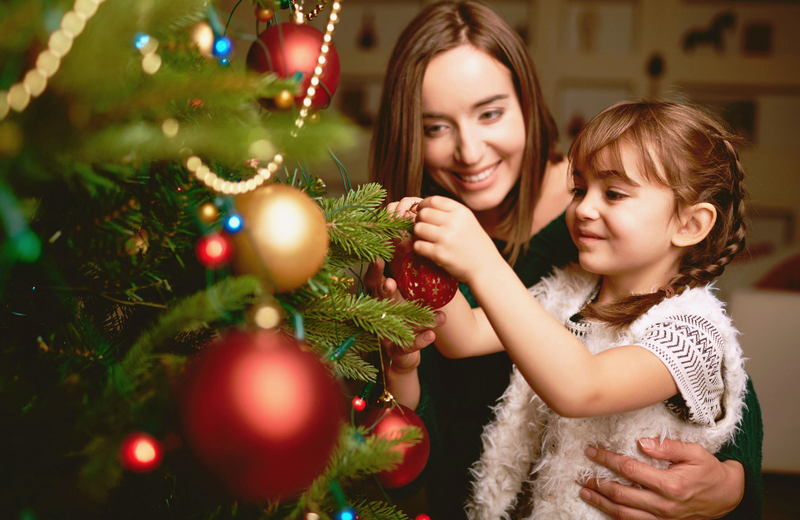 Whether you choose the constant mess of a real pine tree or the puzzle-like hassle of a fake one, setting up a Christmas tree is one of the biggest pains involved with decorating for the holidays. Skip the traditional bundle of stress and opt for something more unique. A DIY tree can be made out of absolutely anything. Have a ton of books? How about leftover bags of balloons from a birthday party? Have you suddenly found yourself with a collection of Amazon boxes while buying gifts? Stack them up to create a one-of-a-kind decoration in your home. All you have to do is string a few lights around them, and you've got yourself a DIY tree. Why does anyone guess what to buy someone for the holidays? The number of returns and never used gifts after the 25th are staggering, and you've probably returned several items yourself. Instead, why not try being more direct this year? Start with your family by just asking them exactly what it is they want or need this year. Have them create a list with three to five items on it, which helps to keep things within your budget. Next, have friends, coworkers, and anyone else do the same. Taking the guess work out of gifts eliminates a load of stress, leaving you more time to actually enjoy the season. Tired of dressing up for holiday soirees? Think ugly Christmas sweater parties are so 2005? Is Halloween one of your favorite holidays? If you answered yes to all of the questions above, then why not add a little shock factor to the next party you attend? Instead of showing up in whatever the "appropriate attire" is, come dressed in the best costume you can find. Make it a Kiss Christmas, show up as Jason Voorhees, or come dressed as your favorite superhero and insist that you are saving the party. This a fun way to deviate from the norm while giving your friends a good laugh in the process. The more people you can get in on the joke, the better. Originally started as a joke for the comic TV series, fans and the internet have helped turn Festivus into more of a mainstream alternative to the traditional holiday season. You can choose to stick with how the show celebrated, or make your own modifications. Start by replacing your tree with an undecorated, aluminum pole. Next, you'll need to leave a fruitcake out which no one will eat, because no one ever does anyway. Dinner consists of either spaghetti or meatloaf, after which, everyone will take part in the Airing of Grievances where they share which presents they received last year disappointing them. Follow that up with Feats of Strength, a wrestling match against the head of the household, and you've just celebrated Festivus. Again, you might want to make a few altercations to keep things lighthearted, but this an excellent way to deviate from the norm. For many, what would normally be a welcomed day off from work is spent waking up early, dealing with family, and ending up exhausted by the end of the day. Why not actually enjoy your extra day off from work instead by becoming an introvert? Tell your family that you won't be able to make it to dinner this year, inform the kids that no one will be waking up early on Christmas day, then turn off your phones so no one can bother you about leaving your home. Skip formal wear and dress comfy, then kick your feet up and relax. You'll be happy to stay home and relax, your kids will be happy to play with their new toys, and no one has to cook or clean. Isn't that better? If the above is an impossibility, you could always create a reason to get away from the hustle and bustle of the holidays. Leaving town on vacation, for instance, isn't something your family will be able to argue with. Even if they do, you probably won't care once you're sitting on the beach with a margarita in hand (provided you went to the beach, of course). After shaking up your holidays with a little alternative festive fun, there's nothing quite like coming home to relax in style and luxury. LA's most desirable downtown address, Eight & Grand, offers just that. This Greenpoint-rated building offers sustainable designs, spacious floor plans, and resort-style amenities right in the heart of vibrant Downtown. Surrounded by urban culture and crafted from contemporary design, these homes bring new life to lavish living with premier services and the finest in accomodations. Spend the holidays in a home you won't want to leave. Celebrate the season at Eighth & Grand.